Review: The hunt continues as Cal Ormond runs for his life in a desperate attempt to solve the Ormond Riddle and answer all the questions surrounding his family’s past. He has 365 days to live, and the countdown continues in Gabrielle Lord’s May, the fifth book in the Conspiracy 365 series. The book begins with Cal being held in the Leechwood Lodge Asylum. One of his enemies who is trying to get his hands on Cal’s drawings has convinced the authorities that Cal is actually Ben Galloway, a boy in desperate need of psychiatric help in dealing with reality. Doctors are convinced Cal is delusional, and his claims that he’s not Ben Galloway only prove to support their assessment that he is fighting reality. Cal’s first goal is to escape the asylum, however being held in a straightjacket seems to pose a problem. When everything seems hopeless, Cal eventually finds hope. In a clever scheme, his friends help Cal escape, and send him on his way to his great uncle, Bartholomew. However, finding a safe haven with his uncle proves to be anything but safe. Cal’s pursuers seem to be able to find him anywhere. Will he ever escape? As more clues to the riddle begin to unfold, Cal continues to fight for his life – and his sanity. Once again, Gabrielle Lord has written a spell-binding book. Readers will begin on the first page (page 181) and surge ahead until they finally reach the end (page 1) – only to eagerly await the next book in the series. Caution: May is the kind of book that might even cause readers to skip meals in order to find out what happens next! 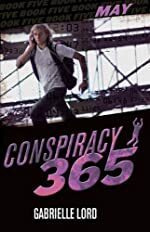 The Conspiracy 365 series is quite possibly one of the best series books for young adults on the market today. The books are relatively short, and they are very quick reads. This makes it a perfect series for the over-scheduled teens of today who want that instant gratification they can more often find on the computer and in video games. The non-stop action in Conspiracy 365 will grab the reader instantly and not let go until December 31st! Reluctant readers will be inspired to read – and they won’t just be inspired for one book, but rather for twelve. This series could easily take a reluctant reader, and by the end of the twelfth book, turn him into an avid reader. It is a series that would be enjoyed by boys and girls alike, and it has characters that continue to grow and deepen in each book. It is critical though, that readers begin with January and work their way through the series. But, be patient – books are only released once a month, so you may face extreme frustration while you await the next book in the series. However, from what’s been published so far, readers will NOT be disappointed! We would like to thank Kane Miller for providing a copy of May for this review. Have you read May? How would you rate it?